Randy Mangum (behind saddle) was named the 2014 Atascosa County Working Cowboy of the Year before the Pleasanton Young Farmers’ rodeo on Friday, August 15. Mangum was given the saddle by the Young Farmers and it was donated by Atascosa Livestock Exchange. He also received a denim vest from the Pleasanton Chamber of Commerce, a bandana from Texas Moore, a bandana handmade rawhide slide from Roy Alonzo (2013 Cowboy of the Year) and a framed certificate from David McDaniel, 1997 Cowboy of the Year and donated by the Pleasanton Express. Left to right are Sue Brown, editor of the Pleasanton Express and emcee, Jorge Quiroga, Wade McBee and Chico Cox, Pleasanton Chamber of Commerce directors; David McDaniel, Randy Mangum, Gus Wheeler (Atascosa Livestock Exchange), Texas Moore, Randy Rice (Young Farmer) and Dustin Neal, Pleasanton Young Farmers president. Three cowboys – one posthumously – were honored at the Pleasanton Young Farmers’ Cowboy of the Year Open Rodeo and Festival this past weekend. Randy Mangum, chosen by former Cowboys of the Year, joined the select group. 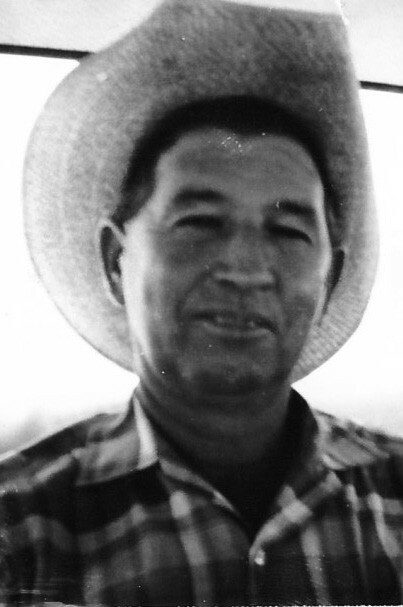 His father, C. S. “Pete” Mangum (who passed away in 1990), was also inducted into the South Texas Cowboy Hall of Fame along with Margarito F. Guevara. Randy was presented a hand tooled Ringlestein saddle by the Young Farmers which was donated by Atascosa Livestock Exchange. He also received a blue jean vest from the Pleasanton Chamber of Commerce and bandana given by Texas Moore as well as a handmade rawhide slide made by last year’s Cowboy of the Year Roy Alonzo. 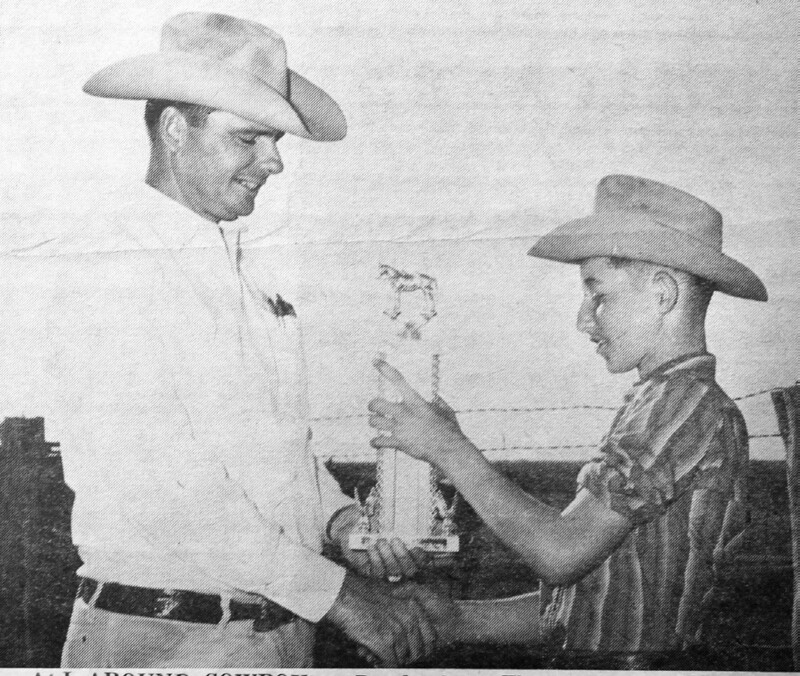 He was presented a certificate by David McDaniel, 1997 Cowboy of the Year donated by the Pleasanton Express. Margarito F. Guevara received a bandana and a certificate, too. The family of Pete Mangum also received a certificate. Randy Wayne Mangum was born in 1953 in Poteet, Texas to working cowman C.S. “Pete” Mangum and Pauline Mangum. Through his infant and toddler years, he was exposed to cattle horses and almost any other kind of livestock imaginable. As most real working cowboys, he was on horseback at age three. Being from a large family in poor times, his respon- sibilities with the livestock became that of a grown man. His knowledge and experience with cattle and horses grew in grand proportions each year as he helped his dad in all aspects of the ranching business. Through his school-age years, he spent his time helping with the family livestock, breaking colts, day-working for neighbors and family members. He also competed as an athlete in school and at the family arena, where many hours were spent roping with friends and neighbors. After graduating from high school, Randy went to work for the USDA inspecting cattle. It was a job in which he could be around cattle and horses everyday, but it wasn’t ranching. He moved on to manage a ranch near Hindes, Texas and then to Morales Feedlot. At Morales, he spent his time pulling sick cattle, learning the ailments and remedies associated with a feedlot environment. Randy’s next job was managing a ranch near Carrizo Springs. The work and life was great, but he wanted his own cattle. The opportunity presented itself in 1979 at 26. Randy moved his wife Sharon and two boys back to Pleasanton to stay. He leased a small place near Poteet and borrowed enough money to start a small cow/calf operation. To help support his new family, Randy went to work at the Union Stockyards in San Antonio, where his dad had worked and he had spent a lot of time growing up. After five years at Union Stockyards, he became a commission agent, buying and selling cattle for other people. His ability to judge all classes of cattle in quality and weight made him very adept at sorting and shaping up cattle for his customers. When he was not working at the stockyards, Randy spent his time tending his own cattle, working cattle for his clients, friends and neighbors and catching wild cattle for anyone that needed that service. Great horses and good cow dogs helped Randy to find and rope wild cattle. Over time, his cattle herd and growing connections allowed him to lease more country and get started in a stocker cattle operation as well. As some of you may know, a stocker cattle operation requires daily commitment and hard work. You must have knowledge of cattle and their habits, market volatility, ailments and remedies, weight gains, forage qualities and marketing strategies in order to be successful. Our recipient has and is currently operating as a successful cow/ calf producer and running a productive stocker cattle operation in Atascosa and surrounding counties. Through the years, making a living in the cattle business, Randy also managed to help raise two boys with ranching in their blood. Both his sons are very proud and grateful for the knowledge and way of life that he has passed on to them. At age 60, Randy’s best days are still on a horse, working cattle and living the life of a true South Texas cowboy. Randy Mangum deserves the title of Cowboy of the Year for several reasons. First, 60 years of experience as a cowboy speaks for itself. Cowboys are born, not made or taught. Cowboys start learning from birth and never stop. Cattle and horses are their life and they strive to know all they can about them. Second, Randy has ridden some of the best ranch horses in South Texas. Not always the best looking or gentlest horses, but horses with heart that loved their job as much as he did. Finally, as far as character and dependability are concerned, Randy is human, but I have never known a more honest or dependable man. These are attributes that a real cowboy takes as seriously as their work because dignity, honor and pride mean everything to them and their business. Randy truly understands the difference between right and wrong and will treat others as he would want to be treated himself. These things being said, Randy truly deserves the title of Cowboy of the Year. He was nominated by his sons, Clayton and Colby Mangum. C. S. Mangum, known as Pete to family and friends, was born June 16, 1921 into a ranching family. Pete was raised in Poteet, Texas. 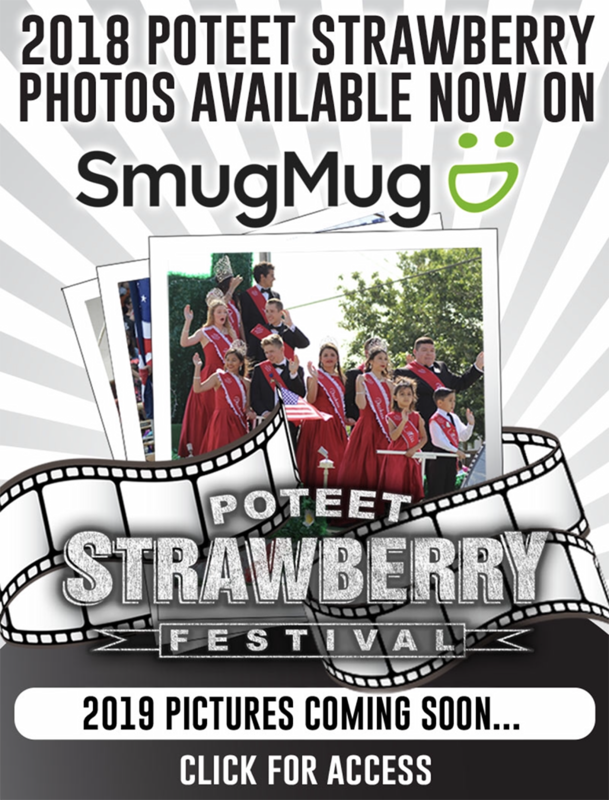 With his own roots strongly established in him hometown, Pete raised his own family in Poteet. At age 17, Pete went to work on the Cameron Ranch, which was located south of Fowlerton, where he worked for Ed Roechel. He worked there until the beginning of World War II. Pete enlisted in 1942 in the Navy. He served his country proudly for four years. World War II ended in 1945 and he was released from the Navy in 1946. Pete came home and back to his roots. Ranching still flowed strongly through his veins. He knew his calling. Pete ranched his whole life and loved every minute of it even during the hard times. During this time of his life Pete went to work at Union Stockyards and started out working for Union Commission for two years. He then joined Alamo Commission Co. which was the beginning of a 35 year career. Then in 1984 he joined his son, Randy, who owned John Clay Commission Co. He worked there until his death on March 23, 1990. The cowboy way of life is a very special honor to those who chose to live that way. My dad is one of those men that chose to be a cowboy for his entire life without any regrets and even today at 83 years of age his heart is full of love for the cowboy way of life. Today I nominate my dad to be selected into the South Texas Cowboy Hall of Fame. This man that I call dad is very much deserving of this honor. My dad was born on January 05, 1931 and by the age of 14 or 15 he began working for Mr. Tom Campbell Ranch in north Atascosa County who in 1971 was nominated into the Cowboy Hall of Fame himself. This was an opportunity for him to learn all there was to learn about being a cowboy. He loved being a cowboy and learned from the senior cowboys which he came in contact with and self taught himself all he could learn. After a few years he was given the opportunity to work on the larger Campbell Ranch in the southern part of Atascosa County which was 8000 acres and the need to care for a larger number of cows, horses, pigs and even dogs was in demand. Here he continued to learn and polish his skills to the best of his ability. Here he became one of the best ropers around, became ranch manager, a self taught veterinarian as he cared and doctored all the animals as medical attention was needed, managed the wildlife that existed on the ranch, one of the best fence builders around and everything inbetween. Many of his cowboy friends respected him for his roping ability. They would say that if my dad missed his catch that was very rare. When my dad started teaching me how to rope he told me that in order for a roper not to miss his target, his technique was to pitch your loop at the animal’s head like a ball pitcher would pitch a baseball to the catcher. Other cowboys have told me that they felt that my dad had like a sixth sense for finding the animals in the woods. The normal method of working the cows and calves on the ranch was out on the open range. During the epidemic of ticks and fly worms it was important that all the sick animals be doctored or treated with medicine. In order to find these animals my dad and others would have to track them and bring them to the treating site. The cowboys felt that my dad’s sixth sense allowed him to retrieve more animals and locate them faster. My dad’s doctoring did not stop at cows and calves because he cared for all the animals on the ranch to the degree that a mother would care for children. I still can recall that unique aroma that I would smell when he returned home after being gone all day. The aroma of the medicine used for the tick epidemic was yet different than the one used for the treatment of the fly worms. I was taught a great deal about the wildlife because from time to time he would come home with one of the wild animals such as baby alligators, turtles, snakes, birds and etc. I recall him telling me that he had spent the day helping a mother deer locate her lost fawn. If he found a wild animal in need of medical treatment he would do all he could to treat the animal. He also taught me how to care for and respect the wildlife of the ranch. Another task for my dad was to account for all the animals. If an animal was missing an assessment needed to be made. If it was laying up sick somewhere or if it may be dead, my dad would use the wild animals to assist him with this task. The sign of buzzards, howling or singing of coyotes, and wind smells gave him clues as where to search for these missing animals. I will never forget the many miles of fence that I helped my dad build on the ranch. All of the fence building was done by hand, even the clearing of the right of way for the fence. My dad prided himself in fence building to the degree that the neighbors and others recognized him as the best fence builder around the area. A cowboy on a ranch has many other positions to fill and my dad contains a vast amount of knowledge which qualify him to be one of the best cowboys around. The one most important position of all is proudly sitting in a saddle on top of a horse and if not working cows – just riding will always bring a smile to a cowboy. In the position of ranch manager for his entire life, never did I ever hear any complaints or regrets from him at all. There is only one thing that I still continue to see and that is his LOVE for being one of the best cowboys around. After 83 years of being a cowboy the honor of becoming a member of the Cowboy Hall of Fame would be the greatest honor and recognition that he could take to his grave. He was nominated by his son, Miguel Guevara. Nominations for next year’s winners are solicited in June/July each year. The criteria needed for these individuals to be honored should have the following qualities: • Be an experienced cowboy; • Have overall knowledge and ability with a horse; • Have the ability in working with the trailing cattle herds of various sizes in the brush country; • Have knowledge of cattle habits and ailments; • Have good character and be dependable; • Why they are worthy of the Cowboy of the Year title or to be inducted into the South Texas Cowboy Hall of Fame. 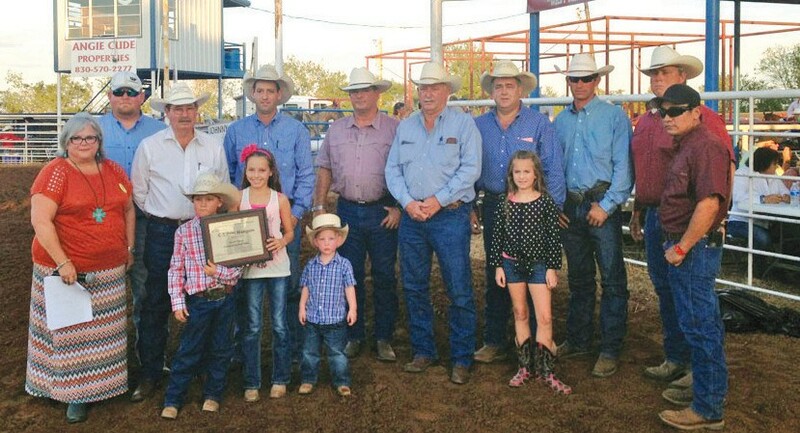 The family of C. S. “Pete” Mangum gathered after he was inducted posthumously into the South Texas Cowboy Hall of Fame during the Pleasanton Young Farmers’ event last Friday night. Left to right are Sue Brown, Pleasanton Express editor and emcee, Wade McBee, Pleasanton Chamber of Commerce, Jimmy Mangum, Layten Mangum, Camry Mangum, Cline Mangum (in front), Colby Mangum, David McDaniel (1997 Cowboy of the Year), Randy Mangum, Randy Rice, PYF (with daughter Whitney), Dustin Neal PYF President, Chico Cox and Jorge Quiroga, Pleasanton Chamber of Commerce. 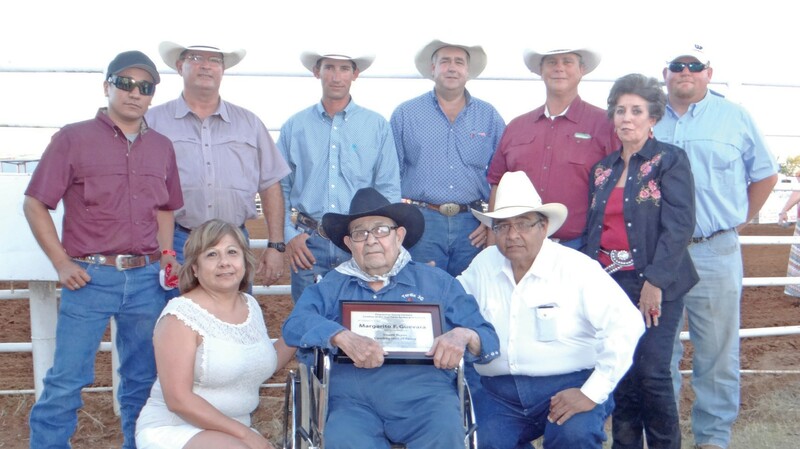 Margarito F. Guevara, seated, receives his certificate during his induction into the South Texas Cowboy Hall of Fame before the Pleasanton Young Farmers’ Cowboy of the Year Open Rodeo on August 15. He is flanked by his daughter Margie Guevara-Clark and son Miguel Guevara. Helping with the presentation are, left to right, Jorge Quiroga, Pleasanton Chamber, David McDaniel (Cowboy of the Year 1997) Dustin Neal, President Pleasanton Young Farmers; Randy Rice, Pleasanton Young Farmers; Chico Cox, Texas Moore and Wade McBee, Pleasanton Chamber. C. S. “Pete” Mangum in an early photo. Pete was inducted into the South Texas Cowboy Hall of Fame at the Young Farmers’ rodeo. Randy Mangum of Poteet is being presented a trophy as allaround cowboy of the first annual Atacosa County Junior Horse show, by Bob Hindes, show superintendent. The award came on the basis of most points collected overall in various horse contests held Saturday afternoon at American Legion Park Rodeo arena. 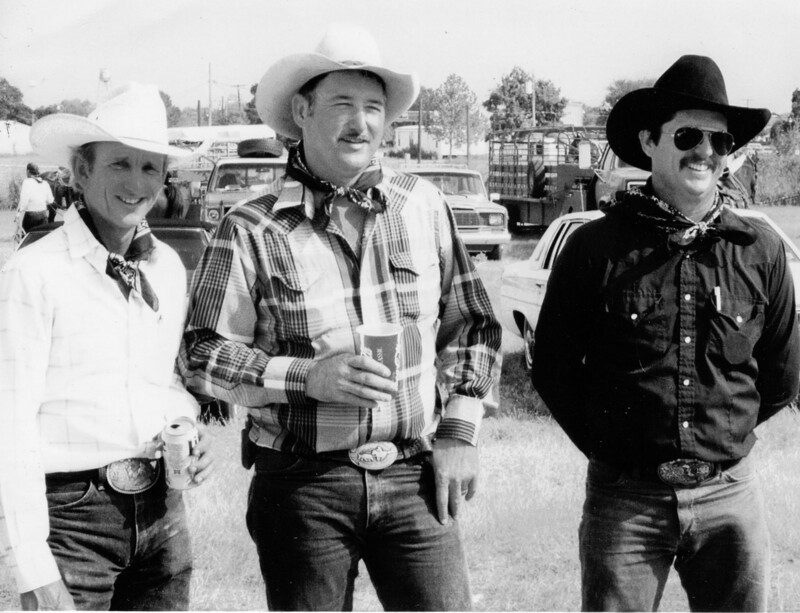 Johnny Yow, Randy Mangum and Mike Simmons doing their thing at the Poteet Balloon Fest ranch rodeo in 1993. 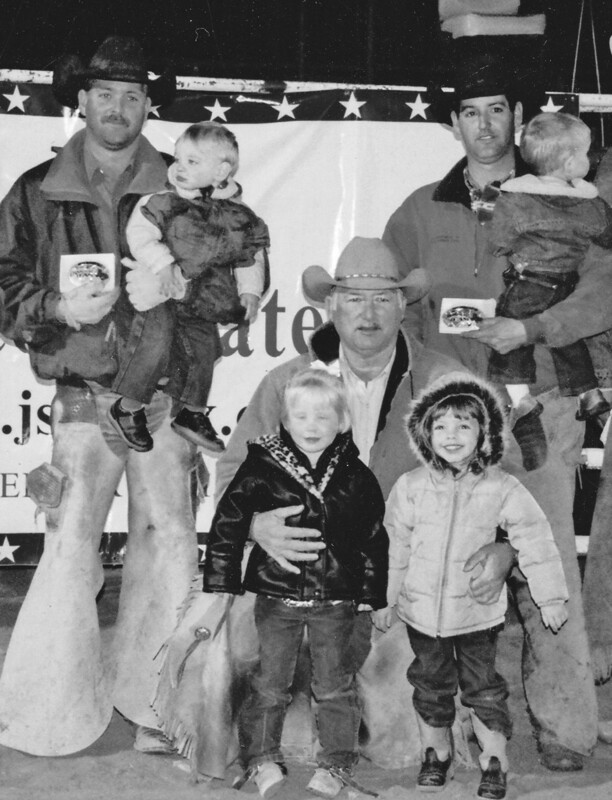 Randy Mangum, (kneeling with granddaughters Blye and Camry) and sons Clayton (with Rance) and Colby (with Layten) are proud winners at a ranch rodeo in Laredo.